For a company that stopped making ereaders and got out of the ebook market in 2014, Sony sure is good at finding new excuses to make devices with E-ink screens. Rumor has it that Sony has a 10" replacement for its DPT-S1 writing slate in the works. Yesterday a new member of MobileRead posted a screenshot which they claimed was taken from a recent Sony survey. 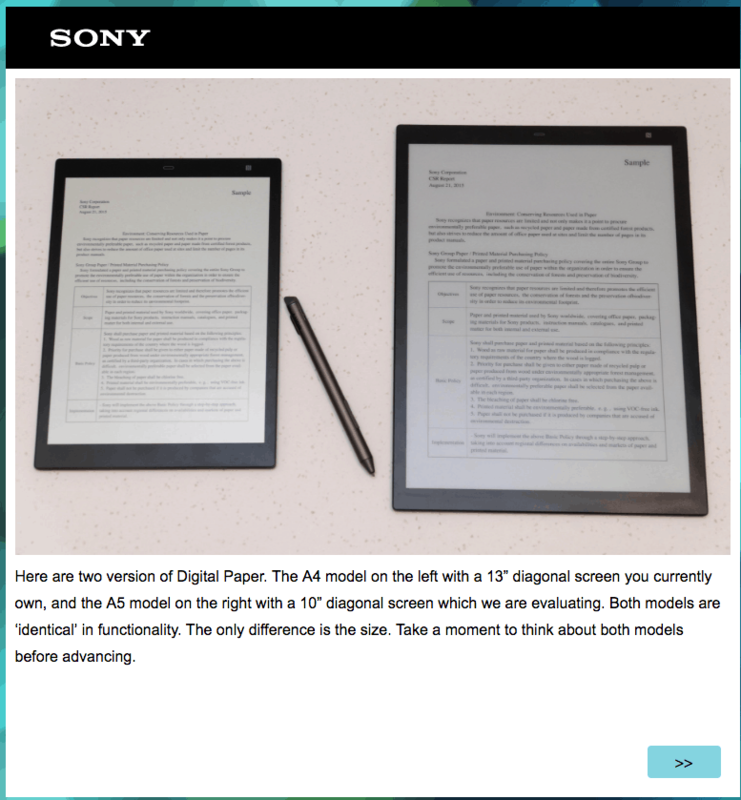 The screenshot shows a 10" device next to a 13.3" device (and no, we don't know what Sony asked next). And let's also not forget that this was someone's first post on Mobileread, which increases the chance it could be a hoax. But if the survey is real then it means Sony is thinking about releasing a 10" writing slate, possible one with the 10.3" screen teased on the Boeye T03 ereader or the Remarkable writing slate. If it does have that 10.3" E-ink screen, it will have a screen resolution of 1404 x 1872. That is considerably sharper than the screens found on current 9.7" ereaders (825 x 1200). The text in the screenshot hints at the smaller device having the same features as the DPT-S1, which means it would support PDFs but not much else. That is going to severely limit its market, and so could the price tag. The DPT-S1 cost $800 when it was finally discontinued, and odds are its smaller replacement would be almost as expensive. Coincidentally, existing 9.7" ereaders are rather expensive - 359 euros and up. If the new Sony device can come close to matching that price then it would be a serious contender - even limited to supporting only PDF. No frontlight, no epub support, plenty of profit (most likely) to Sony built-in. No thanks. Kobo’s native support for PDF on their 7.8″ KA1 is pretty terrible but KoReader’s PDF support on the KA1 is pretty good and 8 is not so different from 10. It’ll do. At way less than half the cost, the Aura One seems to make a lot more sense. People are still looking for used big Sonys. Apparently they are best at PDF manipulation, and there is a market for that. I’ve got a DPT-S1. Bought direct from Sony USA at full price and registered with them. Consequently I got the survey directly – and am sure it’s valid. Not that I’d by a 10inch thou, the whole point of the 13 was full A4 support and it works a treat. They sent out a survey to those who bought DPT-S1. From the description they provided in the survey I don’t think that it’s viable product. I doubt that they will ever produce it. What they need to make is a 13″ with more RAM and better processor. On the other hand, Apple just dropped the price on their 10” Ipad. Well, it’s still good news, this mean Sony is not killing the project, for a DPT-S1 owners that means the software will keep updating, I hope that now that they consider a smaller size reader, they will enhance document zooming features, currently you can’t zoom the document and use all the features in the reader. I pre-ordered a remarkable, still, I think if Sony brings another DPT, I would consider getting one, these large screen digital paper tables are really good for reading a note taking, I do all of my analysis & sketches on the DPT-S1.